Other artists on hand to pay their respects to the late singer and guitarist included members of Pearl Jam, Alice in Chains, Black Sabbath and more. Dave Grohl gifted Collier Cash Rule one of his guitars at the end of the performance. 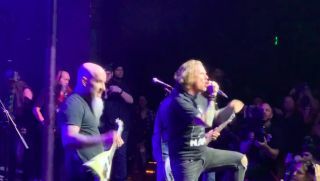 Novoselic joined the Foo Fighters in Seattle to perform "Molly's Lips"
The gig also featured an appearance by Queen's Roger Taylor, who performed with the Taylor Hawkins-led cover band Chevy Metal. Foo Fighters—who we profiled in the December issue of Guitar World—have announced a 2018 North American tour in support of their new, chart-topping album, Concrete and Gold.